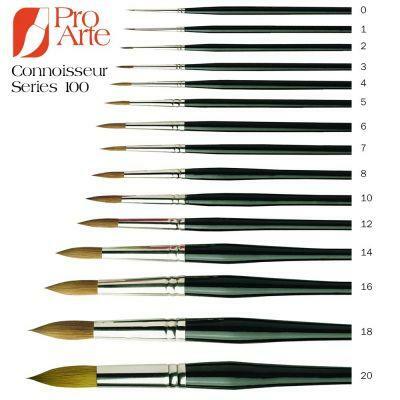 A Connoisseur brush is a beautiful blend of Prolene and sable. The mix is critical and took time to perfect but the result is remarkable. 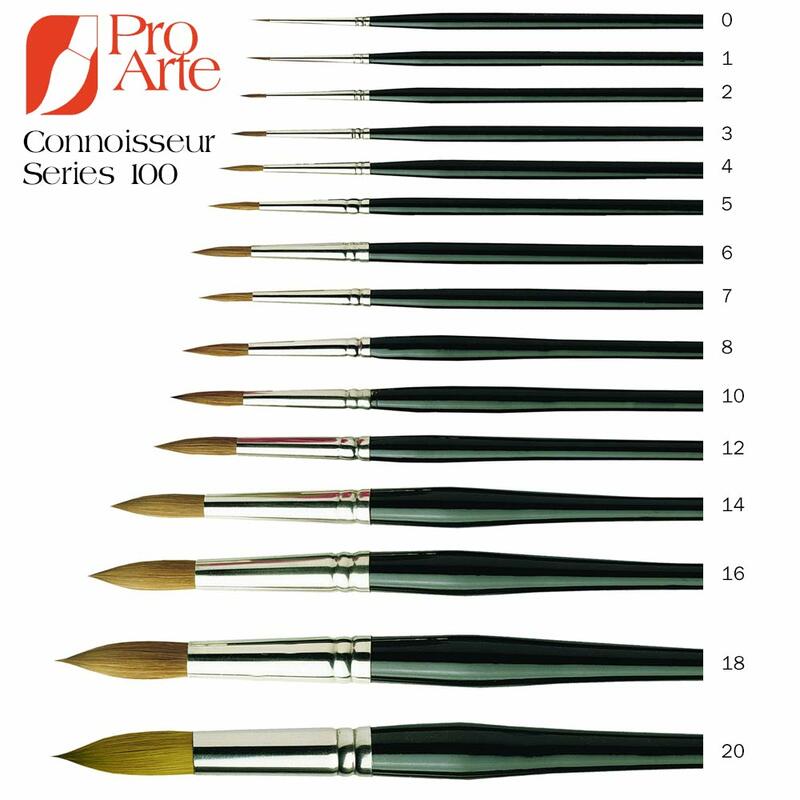 Here is a brush that satisfies the purist... it feels and looks like sable; it bellies, holds colour and points in the manner which one has come to expect from a Pro Arte brush. It also delights the thrifty with long lasting synthetic content, which helps to keep the price way below a Kolinsky sable. 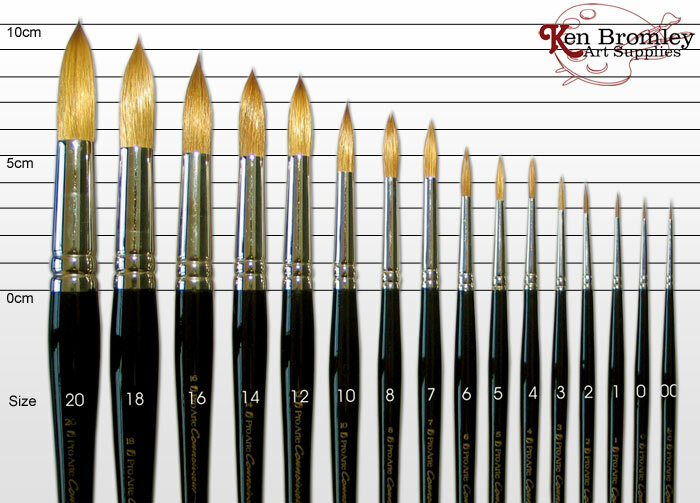 Designed and formulated for use as a watercolour brush, it performs well in every way and has been a great favourite with artists for many years. Seamless nickel ferrules. Black polished handles with red and white tips. A favourite I always come back to! Since I usually have to paint very small details on dolls and figures I tried for the longest time to find proper small brushes. A lot of the small ones can barely take up the paint, the hair is too long and thus quickly bends when you apply too much pressure on the brush and can't be controlled well. One day I ordered some art supllies and added these to my cart, hoping I would finally find a good tiny brush, and I wasn't disappointed! The ones I use are the size 0 and 00, they easily soak up the paint and the length of the hair is just perfect to work with, the shape of the top makes it possible to even paint smallest details without a problem and the "broad" base helps a lot to keep up the shape (you can see on the picture that the base is pretty wide and narrows down to a small tip at the point evenly). I also have to admit that I sometimes forget to clean them and they get cleaned days after I have used them the last time. However, I used my last two for nearly three years for most of my works and even forgetting to clean them didn't bother them much and they kept their good shape.